Recently released occupational injury and illness data compiled by the Bureau of Labor Statistics showed a significant drop in the rate of recordable workplace injuries and illnesses in 2015. Private sector employers reported about 2.9 million nonfatal workplace injuries and illnesses in 2015, a decline of about 48,000 from 2014, despite an increase in total hours worked. The rate of cases recorded was 3.0 cases per 100 full-time workers – down from 3.2 in 2014. This rate has declined for all but one of the last 13 years. 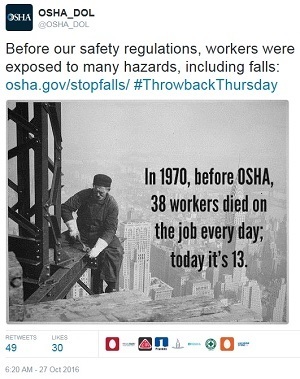 "We are encouraged to see the significant decline in worker injury and illness rates," said OSHA Assistant Secretary Dr. David Michaels. "This is the result of the relentless efforts of employers, unions, worker advocates, occupational safety and health professionals, and federal and state government agencies ensuring that worker safety and health remains a top priority every day." For more information, read the full statement. A temporary worker on his first day on the job at a Mansfield, Ohio, automotive parts manufacturer suffered partial amputation of two fingers. An OSHA inspection found that Milark Industries Inc. failed to install adequate machine safeguards, which led to the worker's amputation as well as other machine-related injuries. Company injury logs revealed another worker received a laceration injury. Milark was cited for: failing to lock out robotic welding equipment; bypassing safety interlocks to maintain production rate; bypassing safety devices while conducting maintenance; and failing to train workers on lockout/tagout procedures. OSHA proposed penalties of $536,249 for seven egregious, willful and serious violations of safety standards resulting from multiple investigations of injuries and alleged unsafe working conditions. Milark has been inspected 10 times since 2007 and has been placed in the agency's Severe Violator Enforcement Program. Read the news release for more information. OSHA inspectors cited Panama City Framing LLC with two willful and two repeated safety violations after observing employees working at heights of up to 22 feet without fall protection. The Panama City, Fla., company was also cited for not having a ladder for workers to access roof trusses, allowing workers to use nail guns without eye protection and failing to ensure workers were wearing head protection. The agency conducted the inspection as part of its Regional Emphasis Program on Falls in Construction. Proposed penalties total $359,878. The company has been cited four times since 2012 for the same violations. For more information, read the news brief. A tree trimmer was fatally electrocuted when an aluminum pole saw made contact with overhead power lines. His employer, Ray Carolan Services Inc., of Fort Lauderdale, Fla., was cited for three safety violations and proposed penalties of $133,617. Violations included allowing workers to use an aluminum pole saw near power lines; exposing workers to fractures and amputations while using an improperly-guarded stump grinder; exposing workers to chemical hazards; and failing to implement a hazard communication program. Read the news release for more information. Five workers were sent to a local hospital after becoming ill from carbon monoxide exposure as they renovated a New Glarus, Wis., nursing home. OSHA inspectors responding to the scene found that carbon monoxide was not the only hazard workers faced on this site. The employer, A&A Environmental Services Inc., also exposed workers to asbestos. "A company like A&A Environmental Services that specializes in asbestos abatement should be setting the standard in employee protection while handling known carcinogenic material," said Ann Grevenkamp, OSHA's area director in Madison. OSHA issued four willful and nine serious health violations to the company with proposed fines of $243,716. For more information, read the news release. CACO Manufacturing Corp. of Houston faces $102,200 in proposed penalties after a worker was crushed and killed by heavy machinery in the facility. OSHA issued 14 serious and six other citations to CACO after finding that the commercial furniture manufacturer failed to securely anchor or guard machines, did not properly identify lockout/tagout devices used to prevent sudden start-up or movement of machine parts, lacked energy control procedures, and failed to train employees on hazardous chemicals present in the workplace. For more information, see the news brief. Iowa OSHA issued $232,000 in penalties to Bridgestone America Tire Operations in Des Moines for failing to provide a workplace free from recognized hazards likely to cause death or serious physical harm to workers. Inspectors found that the company allowed workers to operate machinery with unmarked control buttons and failed to retrain transferred workers on hazards at their new workstations. Inspectors also discovered that procedures were not developed, documented and implemented to prevent the unintentional activation of machinery, which resulted in the amputation of a worker's arm. The North Carolina Occupational Safety and Health Division issued $77,000 in fines to Smithfield Farmland Corporation in Clinton for safety violations. Inspectors concluded that the company failed to properly guard workers from a cutting band saw, exposing workers to amputation hazards. The company installed an improperly adjusted band saw blade guard, which resulted in a worker suffering a finger amputation in April. NC OSH inspectors also observed that workers had their hands close to the saw blade while wearing plastic gloves that were not approved as cut resistant. York Building Products terminated a plant manager after the employee repeatedly reported air quality and other safety and health hazards to upper management at the company's Middletown, Pa., plant in 2014. In a settlement agreement with the U.S. Department of Labor, following OSHA's whistleblower investigation, the company will pay the terminated employee $135,000 in back wages and compensatory damages. "Employers should act promptly and positively when they receive safety complaints from employees," said Oscar L. Hampton III, regional solicitor in Philadelphia. "In this instance, the employer did not, and they are paying the price." For details, read the news release. OSHA will hold a public meeting of the Advisory Committee on Construction Safety and Health Nov. 30 – Dec. 1 in Washington, D.C. The agenda includes remarks from OSHA Assistant Secretary Dr. David Michaels; updates on the National Safety Stand-Down; clarification of requirements in the crane standard; and updates from OSHA's Directorates of Construction and Technical Support and Emergency Management, and the National Institute for Occupational Safety and Health. OSHA is also accepting nominations for eight new members to serve on the 15-member committee. Member nominations and requests to speak at the meeting may be submitted at www.regulations.gov, by mail or by facsimile. Submission deadlines are Nov. 11 for comments and requests to speak, and Jan. 27, 2017, for member nominations. See the Federal Register notice for details. OSHA will hold a public meeting to discuss potential updates to the Hazard Communication Standard on Nov. 16, 2016, in Arlington, Va. OSHA is beginning its rulemaking efforts to maintain alignment of the Hazard Communication Standard with the most recent revision of the United Nations Globally Harmonized System of Classification and Labelling of Chemicals. The agency is requesting feedback from stakeholders on issues that they would like OSHA to consider in the rulemaking. The meeting will be held from 9 a.m. – 12:30 p.m. at the Mine Safety and Health Administration Headquarters, 201 12th St. South, Suite 700, Arlington, Va. 22202. For more information on conference call-in capability and pre-registration instructions, see the Federal Register notice. In addition, two meetings related to hazardous materials are set for Nov. 15 at Department of Transportation's headquarters in Washington, DC. In the morning, from 9 to noon, DOT's Pipeline and Hazardous Materials Safety Administration will discuss proposals in preparation for the United Nations Sub-Committee of Experts on the Transport of Dangerous Goods session in Switzerland later this year. From 1 to 4 p.m., OSHA will host a public meeting of the U.S. Interagency System of Classification and Labelling of Chemicals Coordinating Group. Topics will include an update on GHS-related issues and a discussion of public comments. For more information on conference call-in capability and pre-registration instructions, see the Federal Register notice. Additional information about these public meetings is available on OSHA's Hazard Communication webpage. OSHA has renewed an alliance with the American Staffing Association to protect temporary employees from workplace hazards. During the new five-year agreement, OSHA and ASA will continue to educate workers about their rights, and train staffing firms and their clients on their shared responsibilities to protect workers under the Occupational Safety and Health Act. The key message promoted under the alliance will be: All workers have the right to be safe, regardless of how long they have been on the job. For more information, read the news release. Indiana OSHA awarded Cintas Corporation facilities in Columbus and South Bend with Star recognition as a Voluntary Protection Programs participant. Employers and workers at Star worksites demonstrate exemplary achievement in the prevention and control of occupational safety and health hazards through the development, implementation and continuous improvement of their safety and health programs. The company reported providing more than 200,000 hours of classroom safety training. The results are in for the first Noise Safety Challenge. Held on Oct. 27, the event was hosted by OSHA and the Mine Safety and Health Administration, in partnership with the National Institute for Occupational Safety and Health. The challenge provided opportunities for 10 inventors, selected from 28 challenge submissions to travel to Washington, D.C., to pitch their solutions for reducing hearing loss from workplace noise exposure. The judges awarded first place to Nick Laperle and Jeremie Voix for a custom-fitted earpiece designed to provide a worker with protection, communication, and monitoring. Second place went to Brendon Dever and his company Heads Up Display Inc. for wearable sensor technology that detects noise levels and provides warnings via color-coded lights. Third place was awarded to Madeline Bennett, whose company, Otogear, created an interchangeable decorative attachment that attaches to silicone earplugs. The other selected ideas included hearing protection devices, hardware/software combinations, audiometric measurement and tracking tools, and analysis systems. Although "sustainability" has been traditionally associated with environmental activities, there is a growing movement to expand the definition. 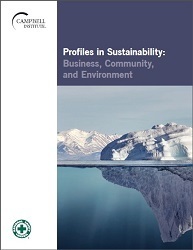 The Campbell Institute at the National Safety Council recently released a white paper, Profiles in Sustainability: Business, Community, and Environment, describing how member companies are integrating worker safety and health into their overall sustainability planning. Safety and health professionals can use the information to define, drive, measure and report their own sustainability efforts.